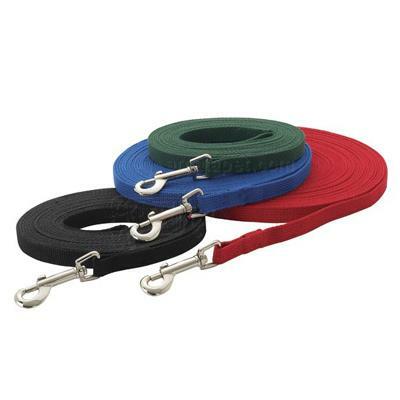 Guardian Gear Leads are quality made for durability, comfort and control. Cotton Web Leads are made of strong, cotton web material and feature heavy-duty nickel-plated swivel snaps. Ideal for training, tracking and obedience work, Guardian Gear Cotton Web Leads are the first choice of professional handlers and trainers. 50 foot long by 5/8 inch wide all cotton web lead. Recommended by trainers. Chrome plated swivel snap. Box stitched for strength.